Gardening on California’s coast has its own challenges, surprises, and rewards—which I learned firsthand when we moved to Point Reyes from Southern California almost 20 years ago. Our property on the northeast slope of Inverness Ridge, with splendid views of Tomales Bay, had winter shade from huge bay and Douglas fir trees at the edge of our cleared site. Undaunted by a brand new home surrounded by nothing but dirt and rocks, I began to design our garden. 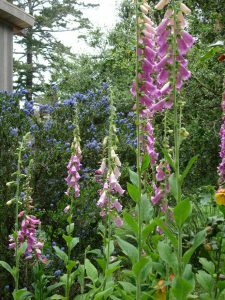 To design and create this garden, I had to adjust to wet, rainy winters (45 inches of rain), cool, foggy summers, and six months without rain. First, I had to learn a different palette of plant material than I used in Claremont, in Southern California. Coastal California, I learned, with its cool summers and wet winters, requires plants that thrive without the warm sun found 20 miles inland from the coast. For example, in Gilroy, the warmest day of the year is in July. In Point Reyes, the warmest day is in September. On the coast, we can grow tomatoes and roses in our gardens’ microclimates, where fences and walls in full sun provide reflected warmth and shelter from cold winds. But these custom habitats need to be carefully planned. I have two Meyer lemons that do well in pots on our patio because the pavement and walls give a warm boost to the cool air. My first priority in planning my garden was to create an enclosed entry courtyard, to protect it from deer. Later, we would landscape areas between and around our compound of two homes and a guesthouse. My ideas were influenced by the many gardens my husband and I have visited in England, France, Spain, Japan, and the continental United States. Our site, on a fairly steep slope, reminded me of many of the gardens we saw in Kyoto, which I deeply admired. 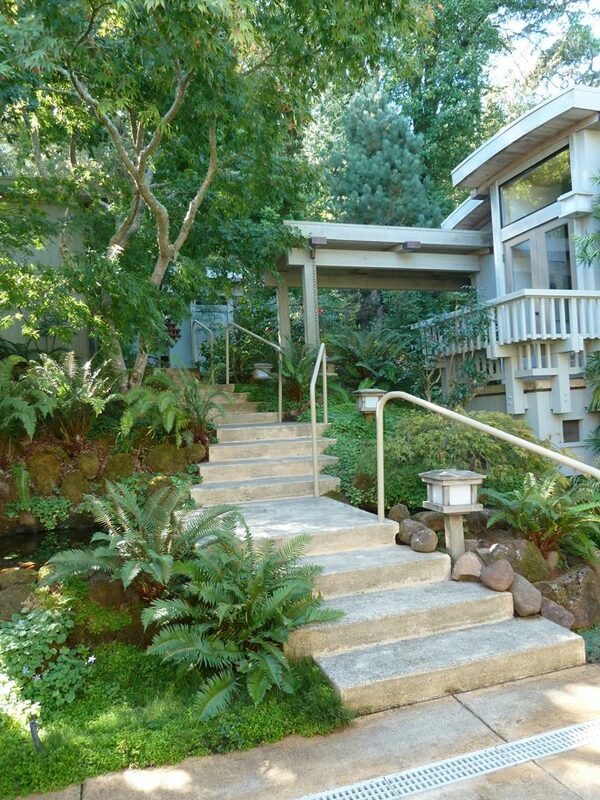 I was also aware that our home’s architecture, the site, and the climate would accommodate a Japanese-inspired, tree-shaded, serene style, and that is where I began. I collected a few more Japanese garden books, pored over their photographs and texts, and checked (again) my collection of photographs. I quickly realized that a real Japanese garden was unrealistic because of the cost of installation and meticulous maintenance. 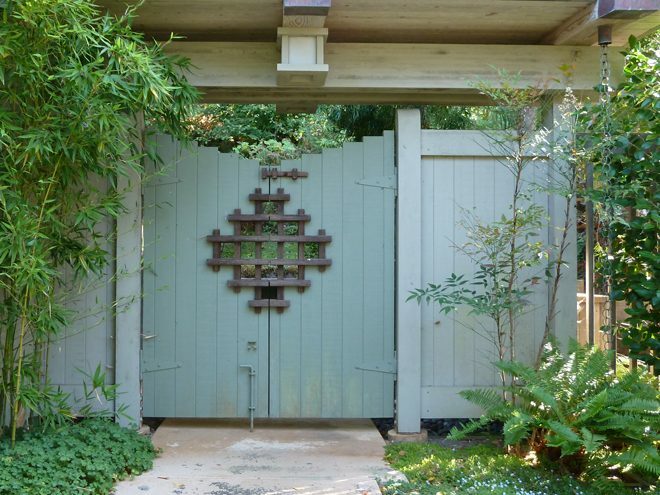 We could, however, create a Japanese-inspired entry courtyard with fences and gates, Japanese maples, shade-loving shrubs, and lots of rocks. Our landscape contractor, Inverness Gardening Services, sculpted the earth in and around the courtyard, installed stepping stones, paved walkways and retaining walls, and brought in topsoil. Working with our architect, they built a series of three small ponds that flow gently one into the other. 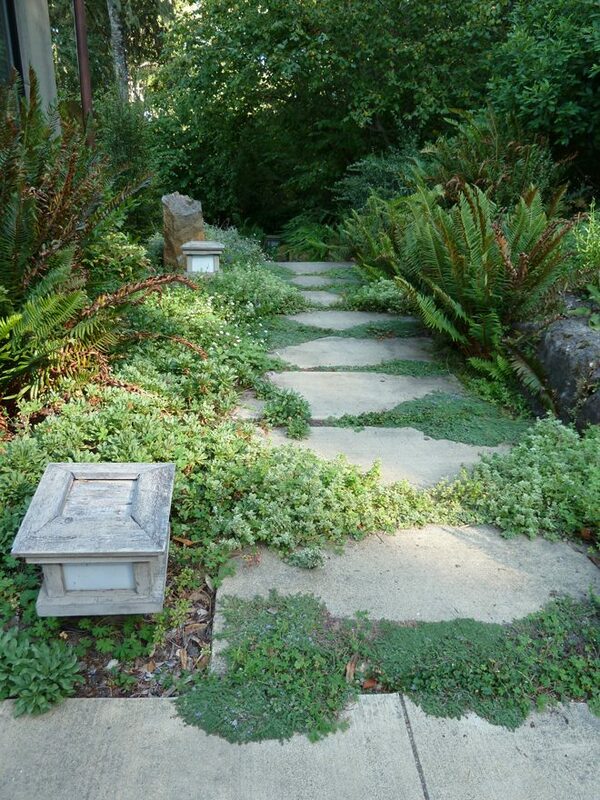 Landscape designer Michael Thilgen, of Four Dimensions Landscape Company (Oakland), helped me with some good ideas and a list of plants that would do well on our site. I also noted which plants thrived in neighborhood gardens, especially those open to deer. 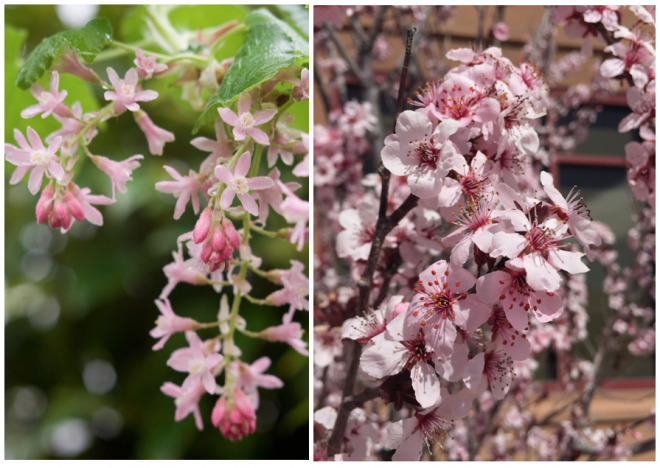 For six months, I scoured dozens of nurseries in the coastal areas of Sonoma and Marin counties, with the lists from my study of typical Japanese plants. In my small Toyota pickup, I collected Japanese maples, bamboos, nandina, ferns, camellias, azaleas, rhododendrons, Japanese forest grass, huckleberries, coral bells, columbine, and anything that looked like moss. I also collected rocks of all kinds, large and small, that bounced around in the pickup on my way home. Japanese maples are the main focus of the courtyard. They flourish remarkably well in this climate. Now over 25 feet tall, they create dappled shade in summer for an understory of evergreen shrubs and groundcovers. In winter, the bare branches create a stunning sculpture that defines patches of (sometimes) blue sky. I initially tried sun-loving annuals and grasses but they looked out of place, and as our trees grew they ran out of sun. We transplanted any grasses and shrubs that require sun to the sunniest parts of the garden outside the courtyard. 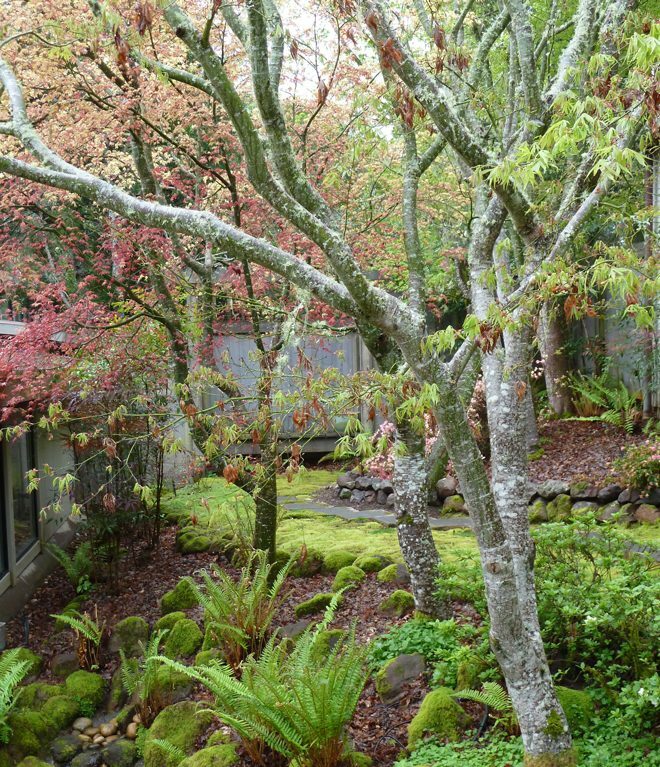 If enclosure is a critical element of Japanese gardens, another is a plant design that works well year-round. Mostly, they rely on evergreen shrubs, ground covers and mosses. 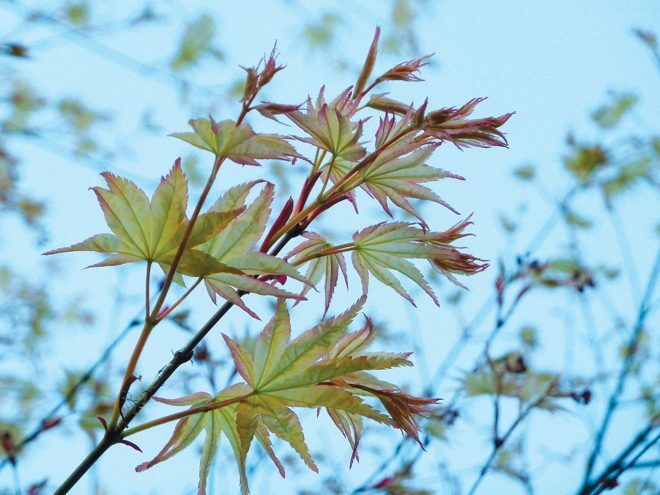 The exception would be traditional deciduous trees—Japanese maples and flowering plums, for example. 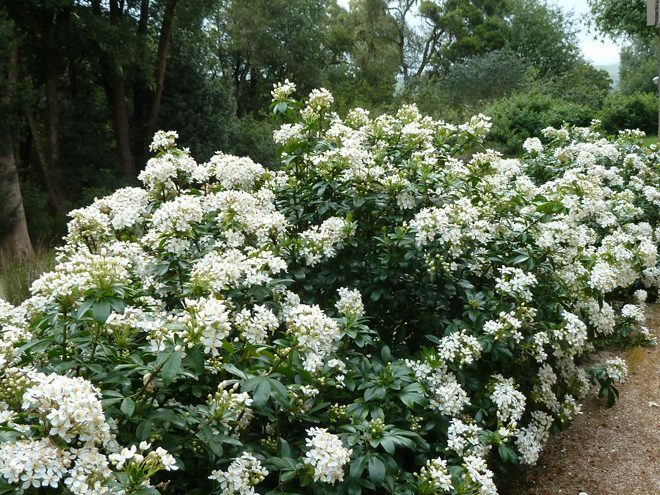 Often, these gardens feature clipped azaleas and evergreen shrubs like camellias and nandina, which have tidy growth habits. These shrubs grow beautifully in California’s coastal zone. I would add to that small list a few of our native shrubs, especially those found in the woods of our coastal areas: ferns, huckleberries, ceanothus, and manzanita. Many cultivars of these natives adapt well to our domestic, suburban gardens near the coast. The landscaping on the rest of our site came more slowly. We wanted to keep it open to deer—less formal, with ample pathways for access in and around the site, and planted with drought-tolerant plants. Many natives have done well here, including coast live oak, buckeye (Aesculus), Fremontodendron, native currant (Ribes sanguineum), western sword fern, coffeeberry, yarrow, Douglas iris, huckleberry, and hazelnut (Corylus). We filled in with society garlic, grasses, lavender, catmint, and especially Mexican orange—a favorite of mine. I enthusiastically planted too many trees because I think they are beautiful and we had the space, including Ginkgo biloba, mayten, dogwood, more Japanese maples, madrone (Arbutus menziesii), coast live oak, and flowering plum (Prunus ×blireana). This garden, now almost 20 years old, is shady, serene, and inviting. Visitors enter our home through a gate into the courtyard—it is our front door. They always stop to admire the garden as they walk down our garden steps from the gate. What was once bare earth—dusty in summer and muddy in winter—is now beautiful year-round, changing with the seasons and providing a habitat that is attractive to view and walk through. We fit in a petanque court and decks and patios with attractive vistas. Our garden provides us great pleasure, not least because the challenges of creating and caring for it have been so satisfying. I no longer miss the oleanders, hibiscus, orange, lime, and mulberry trees of our Southern California garden. A series of articles by Julie Monson that first appeared in the Marin Independent Journal have been compiled into a book. 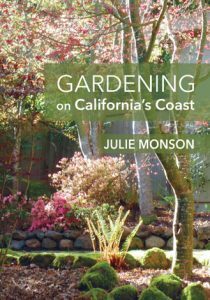 Gardening on California’s Coast is available from www.maplesandmoss.com.